Need San Juan Capistrano bee removal services? The Bee Man has serviced the beach community since 1977. We are experts in live bee relocation and bee removal services. Bee infestations can frighten people and cause unnecessary stress. Do not attempt to remove any bee infestations and call The Bee Man right away. Live bee relocation is the first option we consider when removing any feral honeybees from unwanted areas. However, removing bees alive is not always an option. First of all, our priority is to human and pet safety. Above all, the type of bee will determine if live removal as an option. By observing how bees respond to our approach (using special bee suits), we can tell if the beehive is infested with Africanized bees. Also known as “killer bees,” these bees are very aggressive and pose a threat to humans and small animals. Unlike the more docile European honeybee, these bees will send thousands of bees from the hive to attack a threat. Delaying the removal of bees can pose an immediate threat to those around. Another reason that live bee removal may not be an option is because there are no vacancies at the various beekeepers in the area. Most beekeepers are at maximum capacity. Also, bee colonies are not easy to transport long distances. Sometimes it’s not possible to capture the colony without harming the bee population. The location of the bee infestation is also a factor. We love bees. We do our best to protect them. Above all, our priority is to human safety. 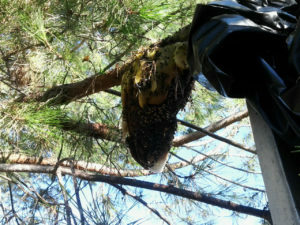 For that reason, live bee relocation is not always possible. The Bee Man offers professional San Clemente bee removal services to residents and commercial customers 24/7. Although live bee removal isn’t always possible, we advise not disturbing the bees. Please refer to our safety tips here. Finally, if you need any San Juan Capistrano bee removal, please contact The Bee Man at (949) 455-0123 before any property damage occurs.